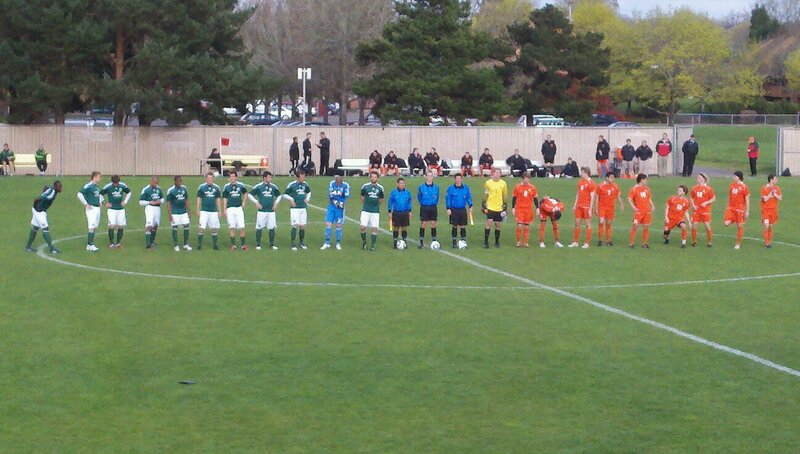 Yesterday I witnessed an exhibition match between the Oregon State University Beavers and the Portland Timbers. This is perhaps a long overdue post about the Timbers. Considering the fact that I will be in Oregon for at least another year and a half, it is only fitting that I support the newly-promoted team. A little history: The Portland Timbers were a part of the North American Soccer League (NASL) that ran from the mid 70s to the ultimate folding of the team in 1982. They appeared once in the final in 1975 and lost to Tampa Bay. This team cemented soccer as a sport in the Portland area and its legacy is still present to this day. The Timbers were also resurrected briefly in the late 80s but were only around for two years. One thing to note is that that particular iteration of the Timbers had Kasey Keller in its pool of players. In 2003, the USL added the re-christened Portland Timbers as an expansion side and were relatively successful both on the pitch and in the stands. The team averaged over 8,000 fans in 2008. This success, along with investor Merrit Paulson and support from the city of Portland, allowed for the Timbers to become MLS' 18th team. The current Timbers squad boasts players like Kenny Cooper (US Men's National Team player during 2010 qualifiers), MLS Draft 1st round pick Darlington Nagbe, former US national team goalkeeper Troy Perkins, Jack Jewsbury and Sal Zizzo (played in Spain and Germany). Their home is Jen-Weld Field (formerly PGE Park). Their rivalry with the Seattle Sounders dates back to the NASL and USL teams, making for a potent Northwest derby. In yesterday's game, it was clear who the professional team was. Although there were plenty of misses, the Timbers controlled the pace of the game and had the larger share of goal chances. Darlington Nagbe was particularly impressive (scored the lone goal), as was Kevin Goldthwaite in the back line. Ryan Pore also had a good game and reserve goalkeeper Guppy should be a good option if the team requires his presence later this season. It was an intimate experience at OSU's Patrick Wayne Valley Stadium, with the stands full of a mix of students and Portland Timbers fans. Granted, there was only one side of the field with bleachers, but it was accessible and free nonetheless. The Timbers Army (fan club) was loud in its chants and drums and made the experience much more enjoyable. 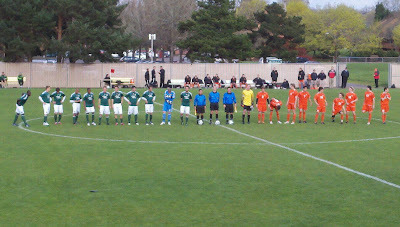 It was a 1 - 0 win for the visitors but the Beavers played well. This, after all, was where Danny Mwanga (1st overall MLS draft pick of 2010) played during college. Another interesting part of the game came from listening to conversations among fans on the bleachers. They ranged from "I miss playing the game," "I like the European style," "this game is being played with FIFA rules," "Timbers are a new team in MLS." Some were familiar with soccer, others were just there with their friends. It became clear, however, that there is a deep soccer culture in this region of North America and that Portland is indeed ready for professional soccer. I hope to attend a few matches myself and you can expect more blog posts about those games. Go Beavs! Go Timbers!